Once English language learners start to be able to decode written words, they are advised to read outside of the class. A great part of learning a new language happens incidentally by being exposed to spoken and written forms of the language. Reading for pleasure is a great activity EFL learners do to improve their language. Graded readers, stories whose language is simplified for learning purposes, are an invaluable resource for providing good models of the target language that learners usually enjoy reading. I have been teaching English for over 10 years and I’ve always recommended graded readers to my students because I am very much aware that reading for pleasure motivates students to read more and boost their autonomy. However, students might mispronounce new words they encounter while reading and without a teacher around those mistakes might get fossilized. This problem is solved with www.readlistenlearn.net, an outstanding, user-friendly website that offers free fiction and non-fiction graded readers along with the recordings of all the texts. Learners would enjoy reading and listening to the stories wherever and wherever they like. 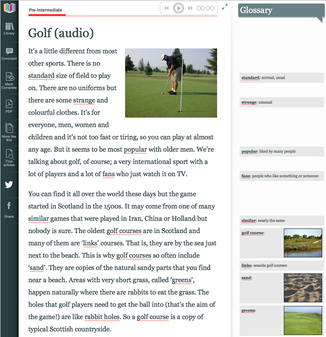 The site includes various stories on different topics and levels where students can choose from. What I like about Read Listen Learn is that definitions of difficult vocabulary appear in the margin adjacent to the words they define. So, learners don't even need to use a dictionary. I recommended the site to my students and colleagues and they utterly enjoyed using it. And now I highly recommend it to you!